Majestic. Picturesque. Enchanting. Huge. Astonishing. Spectacular. Inspiring. Breathtaking. Gigantic. Multifaceted. Grandiose. Amazing. Empowering. Glorious. Magnificent. Beautiful. How many more words can we give to the absolutely unexpected magnificence and sheer size of the Big Bend area of Texas? Totaling more than a millions acres combined, both Big Bend National Park — national park #31 on this grand adventure — and Big Bend Ranch State Park deserve to be on everyone’s must-see bucket lists. Who knew Texas could hold such absolute gorgeousness? The desert, the mountains, the canyons, the river… just wow! FYI, for those unsure where and what it is… the Big Bend refers to the 90-degree turn the Rio Grande River makes in southwest Texas. Of course, it helped that the five-week long federal government shutdown was finally over — and Big Bend National Park open to visitors! 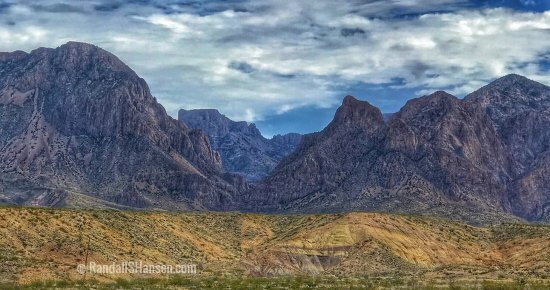 Established in 1944, the park protects more than 800,000 acres — including the largest protected area of the Chihuahuan Desert… and is the only national park that contains an entire mountain range (the Chisos Mountains). It also protects 118 miles of coastline along the Rio Grande River (which serves as the boundary between the U.S. and Mexico). The park is home to more than 1,200 species of plants, more than 450 species of birds, 56 species of reptiles, and 75 species of mammals. Researchers have found sea fossils and dinosaur bones here… and the area’s history is filled with ancient seas and massive volcanic activity. The diversity of landscapes is amazing, as the park includes elevations as low as 1,800 feet to highs of 8,000 feet! The park also marks the northernmost range of many tropical plants and animals — adding to the diversity of the park. We started our park experience with a stop at the Chisos Mountains visitor center, one of two that are open year-round. (We later went to the Panther Junction visitor center, which is the main one — and which offers a wonderful 20-minute film on the park.) We did not get to it, but on the far east end of the park sits the Rio Grande Village (and a seasonally open visitor center), which offers several short trails, including to a hot springs, as well as several river and canyon overlooks from the roadway. 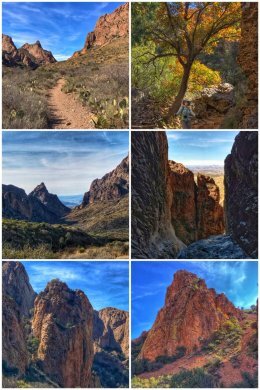 At the Chisos Basin, you can experience the amazing transition from desert to cooler mountain habitats (and pine trees!) as you travel on a winding road that rises 2,000 feet above the desert. 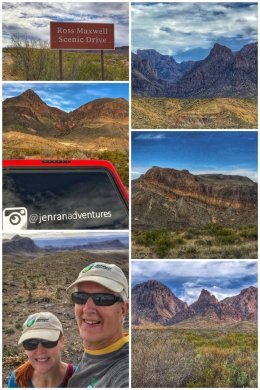 Our first hike in Big Bend was the Window Trail, which is 6-mile (RT) hike from the visitor center. 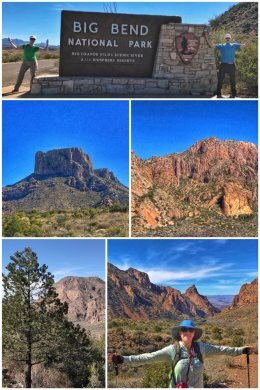 Other hikes in that area include the Basin Loop Trail (about 2 miles RT), Emory Peak (10.5 miles RT), South Rim Trail (15 miles RT), and the Lost Mine Trail (about 5 miles RT). The Window Trail is a fabulous hike down into the basin and into the deep Oak Creek Canyon, eventually following the seasonal creek and ending at the Window pour-off — a 220-foot drop-off at the western edge of the mountains. 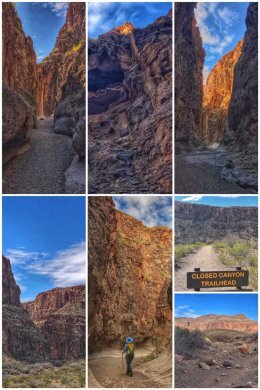 The trail has multiple conditions — from many switchbacks at the beginning of the descent to rocky trail to smooth rock at the creek — and even some steps carved into the stone walls of the canyon. It’s an easy hike down to the Window — but a long and tiring hike uphill all the way back to the trailhead. As an added option, one can hike all or part of the 1.5-mile Oak Spring Trail located near the end of the Window Trail… which heads sharply up a ridge, but after just a quarter of a mile you are rewarded with spectacular views of the mountains, the desert, and the lower end of Oak Creek Canyon. Next up we headed for the Ross Maxwell Scenic Drive, a 30-mile paved road that goes all the way down to the Rio Grande River and another (seasonal) visitor center at the Castolon Historic District — and ends at the spectacular Santa Elena Canyon… with multiple trails and overlooks along the way that highlight several historical and geological features of the park. The drive is named for the first superintendent of the park, who served from the establishment of the park in 1944 through 1952. Along the drive, we stopped at the remnants of Sam Nail Ranch, which offers a short loop walk for visitors — and provides shade and habitat for desert wildlife. Across from the ranch, you can approach the Window from the west, along an old ranch road. We also stopped at the Blue Creek Ranch Overlook, which provides a view of the headquarters of the Homer Wilson Ranch, one of the largest in the region prior to the establishment of the park, as well as a trail down into the canyon; the Sotol Vista Overlook, which offers unparalleled vistas of the entire western side of Big Bend National Park; and the Mules Ears Vista, which provides a closeup view of the Mules Ears, as well as a 2-mile trail that leads to a desert spring. One other stop along the Ross Maxwell Scenic Drive is the Lower Burro Mesa Pouroff Trail, which we knew we had to hike just from the name (as we love burros), but also because of what the hike involved… which was going down into an old creek bed and several slot canyons — before leading to a hidden box canyon with a high, dry waterfall. The almost 4-mile (RT) trail is absolutely amazing, but be forewarned that hikers must do a fair amount of scrambling and climbing over some massive rocks and boulders… especially to get down to the very bottom and into the box canyon to see the view from the edge of the pouroff… but all that effort will be rewarded for the amazing experience you’ll have along the way. 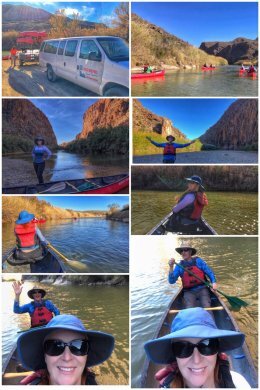 We spent our first day in the state park traveling downstream on the beautifully green Rio Grande via canoe. The river, like many others around the country, is not what it used to be — as irrigation, dams, and agriculture has sucked much of the water as the river winds its way down from headwaters in Colorado — but the levels were high enough to enjoy a peaceful afternoon paddling down through beautiful canyons, including Madera Canyon. Since we do not travel with canoes, we hired Big Bend River Tours — the oldest and best-reviewed river operators in the area. (They also offer multiple other options for river experiences.) We have to say that except for one little turnaround in a curving rapids, we did quite well managing our canoe! 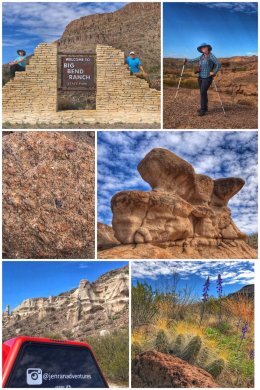 Our next foray into the state park was by car, as we headed to trails that a wonderful ranger recommended to us when we… you guessed it… stopped at the Barton Warnock Visitor Center in Terlingua for information and guidance. Our first hike was the Closed Canyon Trail, a 1.5-mile (RT) fairly easy hike into a narrow slot canyon with ever-increasing tall walls. You know you hit the the end of the trail when you get to an area with water and such smooth rock that you cannot pass. 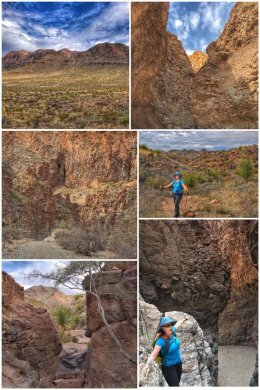 We ended our adventures in the state park with the Hoodoos Trail and Overlook, a fairly easy mile-long trail that leads to a variety of Hoodoos — unique geological “goblin” formations — along the bank of the Rio Grande. Other trails that can be accessed from Highway 170 include the Rancherias Loop Trail, a challenging 21-mile hike through the canyons of the Bofecillos Mountains, and the Contrabando Multi-use System, that offers 25 miles of interconnected trails. 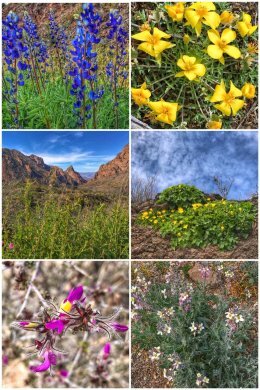 During our visit to the Big Bend, we were lucky enough to see many early spring wildflowers, including Big Bend Bluebonnets (a species of lupines, which we love), Feather Peabush, Yellow Rock Nettle, White Bladderpod, as well as a few we were not able to identify! Of course, we also saw many types of cacti and agave, as well as ocotillo and creosote. And in the mountains, Pinion and Ponderosa Pines. 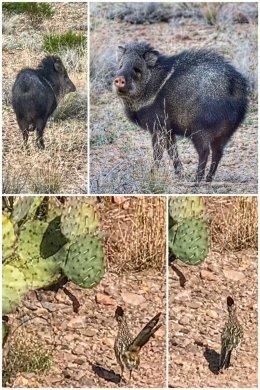 We also saw numerous birds on our hikes — but were most excited when a roadrunner crossed our path on the Window Trail; roadrunners, also known as chaparral birds, are species of fast-running cuckoos — and as you can see from the blurry photos, hard to capture. 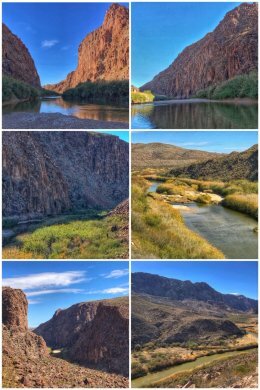 Finally, when all is said and done, we are seriously considering supporting the Big Bend Conservancy, a nonprofit whose mission is to promote, protect and raise funds for Big Bend National Park and the Rio Grande Wild and Scenic River. The Big Bend area should be preserved and protected forever. Next up, we make our way up to other parts of Texas, including Del Rio, San Antonio, and Austin.